Sangat enak disini !. Kolam berenang bagus sekali, staff baik baik aja. Saya suka bahwa hotel ini tidak terlalu besar supaya lebih intim. Terima kasih atas semuanya dan sampai jumpa. Great stay, lovely hotel & people. Thank you to everyone at the Tamukami for making our 40th wedding anniversary such a happy time, and our holliday so special. The hotel is so lovely and peaceful and we will definately come again. Pour nous le meilleur hotel de Bali. Acceuil excellent, personnel très sympatique. Une adress que nous recommender a notre retour en France. This hotel is a total delight from the beautiful spacious rooms to the accomodating, gracioux staff, the restaurant food was superb ! Thank you for everything, terima kasih ! Pourquoi reviens t’on toujours au Tamukami ???? Je n’ai pas la reponse, mais à bientôt. Pour ceux qui pensent que la Paradise n’ existe Pas ! A wonderful retreat, very relaxing and peaceful. We loved the convience, great staff a oasis feeling ! We will continue to return to the land of smiling, gentle folk ! Door de positieve kommentaar van vroegere bezoekers in het gastenboek en op internet waren onze verwachtingen hoog gespannen. En het is onze eerste reis in 36 jaar dat hieraan volledig voldaan werd. Eugeen en Suzanne hebben van Tamukami een echt paradijsje gemaakt. Een idyllische tuin met aantrekkelijk zwembad. Prachtige kamers, een gastronomische keuken, maar vooral de warme joviale sfeer. Dank aan de volledige staf voor de uitstekende bediening en de hartelijke ontvangst. Dank voor Wayan voor de aangenaam uitstappen. Dank aan Eugeen en Suzanne voor de persoonlijke begeleiding en de leuke avonden aan de bar. We zullen Tamukami en de mooie mensen van Bali missen. En jullie hadden gelijk de 3 weken waren inderdaad veel te kort. Wij zijn aangekomen in Hotel Tamukami via aan raden van vrienden. Wat heeft het meegevallen, de mooie uitstappen op aan raden van Eugeen en Suzanne. Het lekker eten, de mooie en nette kamers. Het vriendelijk en warm personeel. Het was zo goed en mooi, dat we zeker binnen 1 a 2 jaar willen terugkomen. Eugeen en Suzanne uw familiale gezelligheid vergeten we nooit. A delightful place to stay, polite and helpful staff. A really relaxing two weeks for our family. We were slightly nerveous about travelling to Bali with our five months old daughter, however it has been a dream. Thanks very much to all the staff. P.S The website does not do this hotel the justice is deserves. Thank you for everything and wedding party. We’ve very very glad and have a good memory. Terima kasih banyak, sampai jumpa lagi. Merci encore pour ce merveilleux endroit pour la fin de nos vacances a Bali. Cet hotel est le meilleur que nous avons eu à travers l’Ile. Au revoir. Most friendly place we have stayed in Bali. It made our holiday very nice. All the best to the staff. Thank you for your enjoyable stay here, we were here too short but we liked it. However it has been a dream! Het was heerlijk om in Bali te zijn. We hebben allemaal genoten van het eiland het strand het eten en het hotel. Thank you for a great stay breakfast, the pool was my favorite. Nice place to rest on way to Lembongan, pool is excellent ! Tres a tot ...we loved it !! Thank you for a really lovely stay at these beautiful accomodation ( hotel ). Really lovely friendly people, nothing is too much trouble. If we return to Bali, this hotel will be the one we return to. Lovely hotel. Lovely surrounding, lovely pool, nice room and big. Will come back again. Thank you. We had wonderful 5 day at this hotel. Thank for your hospitality a superb service. Thank you for a wonderful stay. Lovely staff, pool, restaurant. The birds are amazing too. What a wonderful way to start a diving holiday. Our night was very pleasant. This hotel is very comfortable and staff is gente and kind. Thank you very much for your service. We will return again. I had very happy time here.Comfortable room, and very kind staff.I will come here next time. Thank you very much. Paradijselijk accomodatie en erg gezellig. We kunnen ons geen betere start van onze huwelijksreis wensen. Trivsamt hotel, trevlig personal & frascht rum !. Thank you very much. Just the right place to celebrate our last night in Bali. Thank you for the nice room, the big pool and the delicious breakfast !. All in all a prefect hotel. Michelle and I had a lovely time as always. Thank you for your hospitality and wonderful Tamukami family kindness. Love always, see you all soon. Tamukami far exceeded our expectations. The rooms were very large, clean & modern. Service is excellent and the pool and grounds are beautiful. We will be back. Cet hotel fut l’un des plus chalereux, propre de Bali. Le personnel, très bien formé, est des plus convenables et professionnels. Vraiment un endroit a recommender. We found the staff at Tamukami extremely accomodating and friendly. Our dinner at the restaurant was one of the best we’ve had in Bali. The pool and the grounds are lovely. 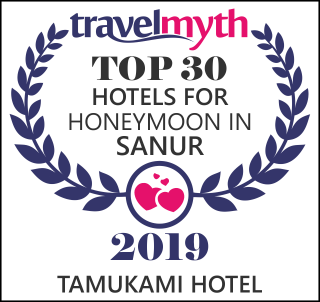 We’d highly recommend Tamukami to anyone travelling toSanur. Wat een geweldige lieve mensen werken hier. De gastvrijheid, de sfeer, de vriendelijkheid zorgen voor een heerlijk vakantiegevoel. Zeker een plek om nog eens terug te kome...al is het maar voor de bloemetjes in ons haar. Another wonderful stay. We will return. Meeting Point in Paradise. Hulf zijn naam met gesvolen. Très agréable hotel et service. Pour les premieres vacances c’est ce qu’il fallait. Merci pour tout. Hotel Tamukami heeft werkelijk alle troeven in handen, prachtig ontworpen en zeer mooi aangelegd, een heerlijk en schoon zwembad, uiterst vriendelijk personeel schone ruime kamers, een goed restaurant met een gevarieerde keuken. We brachten hier de laatste dagen door van onze rondreis door Bali en Java. Het was zalig om hier te kunnen ontspannen. Ook onze twee bengels hebben er heerlijk van genoten. Bedankt voor alles !. Enjoyed Tamukami very much, relaxing, quiet and nice. So much choise in Bali. I find Tamukami a good choice.. Thank you. Spedzitising lectoj tyllus 3 noce. Ale jak do tey pony jest to najwspanialszy hotel w jalim bylisimy ???. Jezele ktos lubi spgakac cras w hotelu, wijdaje nam sie, ze jest to idealue miejsce do tego. Jedijny problem jazi zauwaziylismy to to ze musielisimy sie w nocy na tozde szuzac tazie byto wielkie. Palecany wszyotzim. Had a wonderful time. This is a perfect place to begin your trip in Bali. Relaxed by the pool, had several massages. The food was good. The service was thoughtful. Now we are off to Ubud for two weeks. Thanks. We had a great last day here !. Wonderful atmosphere, good pool and clean room. Friendly personal. Thank you. After spending 3 weeks in Ratu Bagus Ashram ( Energy meditation ), we decided to come here for our last night in Bali. Wonderful choice !. Nice transition before travelling back to Belgium. This is second time to stay here, and it was very nice time again. All staffs are kind and have a good smile !. That made us very very happy. We’d like to stay here again, when come to Bali !. Beautiful surroundings.Wonderful staff. Have had a lovely stay. Will recommend to friends. Wir haben den ( leiden ) kurzen aufenthalt in diesem zauberhaften kleinen hotel sehr genossen ! Das komfortable zimmer, das gute Essen und der traumhaft schone geptlegte garten haben uns sehr beeindruckt. Sehr empftehlenswert in jedes Hinsicht !. We had a lovely holiday in Sanur and the hotel was just as we hoped – peaceful with friendly staff. Loved the pool and gardens enjoyed visiting Sanur. Especially liked the rooms with the walk – in showers !. We hope to return to Bali soon. We had a wonderful time at this most welcoming hotel with a lovely staff. Thank you so much. We only had one night here but it was just the regfresher we needed !. Greorgeous pool, fat shower, yummy breakfast, thank you. Na 4 weken dynamische relaxatie in de bergen bij Ratu Bagus ben ik hier zachtjes op aarde geland. Prachtig hotel, lieve mensen. !! We were not mistaken Tamukami is a little paradise. Tamukami staff is also very professional and always available with great smile. Not to forget Alise’s restaurant which is one of the best of Sanur. We have been traveling in Bali and a little bit of Java for 3 weeks. In the end we wanted for relaxing days before flying back to Sweden. Our place became Tamukami and we don’t regret this. Thanks for nice meetings with friendly personal and great living in your true hotel. We were recommended to stay at Tamukami by some friends who had previously stayed here from the same town as we live in. It was so easy to book on the internet and met at the airport. Our lovely Superior balcony room so large and spacious everything in working and kept so spotless by chamber maids. The pool area is so lovely with beautiful flowers and well looked after. And Alise Restaurant was well seen, with very good selection of dishes. A wonderful meeting place and all the staff so friendly and helpful, definitely will return and stay here in the future ( only suggestion a handrail would be safe for pool ). Many, many thanks for making and stay so wonderful ( beds are super ). All good wishes to everyone for the future. 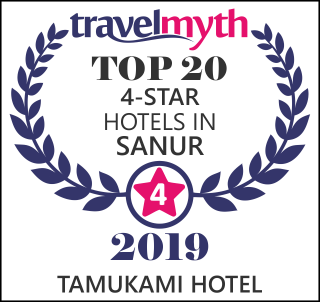 Come to Sanur for 5 days, Tamukami was recommended by our son David who came in Jan 2008, we were very pleased with our accomodation here, loved the quite atmosphere and close to everything and staff treated us so well. Many thanks. We are very sad to be leaving after a wonderful 9 days stay. Thank you so much to all the staff for your help with all our request, our beautiful meals, spotless rooms, and always service with a friendly smile. A specials thanks to all the kitchen, bar and restaurant staff for looking after us so well at every meal, and for making our birthday celebration something special to remember. To Mama & Papa, this is a great place and we’ll be back again. Thank you for looking for us so well and Mr Bintang Beer Batter will be back. What an exellent get away place you have here! Your staff has been so accomodating, lovely room relaxing pool! Hope to be able to return one day! Thank so much! Been to Bali twice before and once again enjoyed the people. Your staff are a credit to your business lovely surronds and atmosphere. Thank you for been great host and lots of fun. Hope to come back again. De rust rond het zwembad keert nu terug.... Mooie locatie, kamer service met extra Lebbeke-touch. Bagus! Ook prachtige start voor Indonesie reizegers! Het Zwembad was de max en het eten zeker! Aan het strand een prachtig zicht en vooral op de Agung de grootste berg in Bali.